SR950 has less menu options. It is designed for use ONLY with a 9.75 GHz LNB. How do I fix a dead Receiver? Adjust the Audio frequency for the affected channel(s) in the setup menu. If that fails to remove the crackling sound, the audio demodulator trimmers on the Tuner Board might need to be adjusted. The trimmers are VERY flimsy so use the correct plastic adjustment tool (you can make one from a plastic knitting needle). b) Enter the audio mode and set to Mono, (tuning bar setting unimportant), Store settings, wait for OSD channel number to clear. c) Listen with headphones to the stereo output of the decoder scart. d) As accurately as possible, adjust RV3 such that it is positioned exactly half-way between the edges of the band of loud white noise. This roughly sets up the 10.70MHz centre. c) Reconnect LNB. Select a channel with a known stereo audio track. e.g. MTV. f) While still in mono, adjust the audio tuning bar for best sound. g) Set to stereo, store settings. h) As accurately as possible, adjust RV5 such that it is positioned half-way between the edges of the undistorted audio band. This roughly sets up the 10.52MHz centre. i) Check the stereo audio on other channels. Should hear no distortion, pops or crackles and no sibilance on speech. j) If possible, heat the tuner module with a hairdryer and ensure that the stereo audio remains in tune, if not repeat the process until the audio tuning remains stable. If not caused by dish/LNB/cable then it's usually a faulty tuner module. A replacement tuner assembly is very expensive. Try removing it and replacing all electrolytic capacitors inside it. You can actually solder new capacitors on the top side and leave the old ones underneath. Usually only the 10uF capacitors cause problems. > fault was down to the tuner and a replacement would be around lbs50. > which capacitor, if any, going faulty would result in this problem. >Dear Martin, many thanks for your help with my sparkly picture fault. What causes no decoder messages with the card in or out? Usually caused by incorrect SETUP. Make sure that video bandwidth is set to NARROW or AUTO. Also replace the 1uF capacitor which is next to the PTV111 chip on the decoder board. >is important but reliability too...)! >reasonable compromise between air flow and fan speed/noise. >reasonable to show you my gratitude? Thanks, Andrea. Our fan kit includes a resistor to limit the fan noise but the zener diode sounds good to me! (See satkit page for details of the miniature fan kit). Is there a Factory Reset? There is NO factory reset but you can get the receiver to tune ALL channels in transponder order by activating the Autotune mode. Then you can press the "smiley" button to enter "favourites" mode and reset the channel order to suit your requirements. It is very tedious to do, however! Press SETUP then MUTE (loudspeaker button). Autotune will take several minutes tuning first the horizontal channels (even numbers) then the vertical channels (odd numbers). You can press CANCEL to stop it but you can't reverse the changes. The screen will display "OK" when Autotune is finished. Press any number to exit. If AutoTune appears to work (you see pictures as it tunes) but the channels don't get stored (just "snow" when AutoTune has finished, then the EEprom is faulty*). Usually a faulty EEprom* but try cleaning out the 40 pin microcontroller IC socket with Isopropyl alcohol. It's usually full of brown gooey flux! 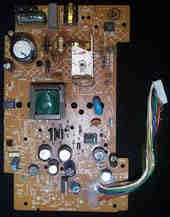 The EEprom is usually damaged by connecting the TV Scart socket to certain models of TV set. Pins 10 and 12 of the Decoder scart are connected to the EEprom. It's best to disconnect them by snipping out resistors R95 and R96 (270R) on the main board. A new blank EEprom will not work. You must fit a pre-programmed EEprom (SatCure can supply). Can I fit a decoder socket instead of the plastic blanking piece? Yes but you might need to fit a whole bunch of other components as well! For a complete fault-finding guide, read "The Satellite Repair Manual" available from SatCure.